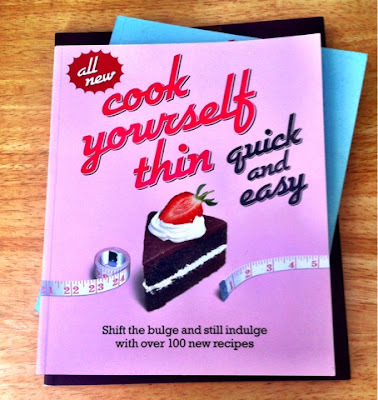 Yes, we're still on a bit of a health kick here ahead of our trip to Portugal, so I'm using the second of the Cook Yourself Thin books for this week's recipe. 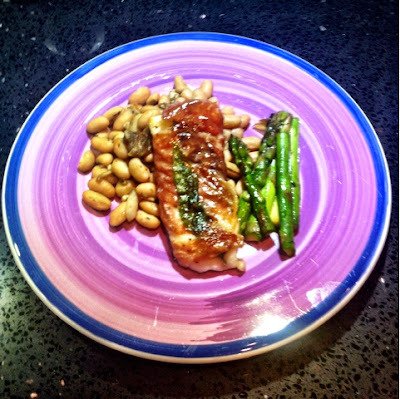 This week I've chosen Cod Saltimbocca which is served with cannellini beans - and in the book - all this is just 259 calories. I say in the book as I'm pretty certain mine will be a bit higher as I don't seem to have the phrase "a spritz of olive oil" in my vocabulary. I didn't go mad with it, but I definitely couldn't say it was a spritz! 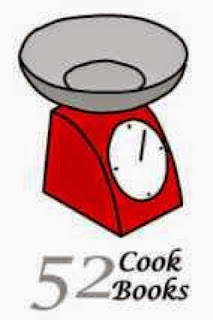 Once again it's a relatively simple recipe. For the beans you fry quite a lot of garlic with some anchovies until the anchovies melt, tip in the beans and add a tablespoon of white wine (I substituted Noilly Prat here, as we're not a white wine household) and some thyme. 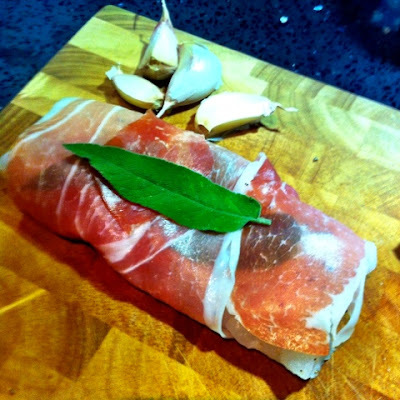 For the fish, you sprinkle it with freshly ground black pepper, top it with a sage leaf then wrap it in the prosciutto and add another sage leaf to the top before frying it in that spritz of olive oil. It really was that easy. Who'd have thought. This was easy to prep and easy to cook. Both the fish and the beans were tasty, and I'd cook both again. More importantly it didn't feel like we were restricting our calorie intake with this meal. I really enjoyed this fish dish, much more than other fish dishes I've eaten for a while. And I think that was down to its taste rather than because it was wrapped with a thin layer of meat! This would make an easy but impressive and healthy(ish) meal for friends.